The Bridgeport is an armor panel used to connect two Defenshield MDFPs at a 45-degree angle. Multiple Bridgeports and MDFPs may be connected in a series to form a ballistic- and blast-resistant fortification. A closeable port is incorporated into the armor face of each Bridgeport, providing a safe firing position for a variety of weapons from behind the units. 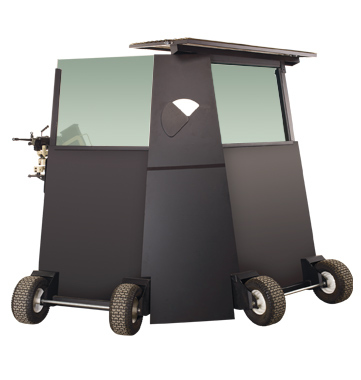 A side gun mount for the MDFP is also available, as well as heaters, shelves and pullout drawer systems. Like the MDFP, Bridgeport units are available with up to NIJ Level IV Armor-Piercing Resistant protection. The unit is 2 feet wide and 6.5 feet tall. The Bridgeport’s steel armor features a durable anti-corrosion powder-coated finish. Camography™ is also available to match the color and camouflage of your Bridgeport to your MDFP. Assembly of the Bridgeport unit is quick and easy, and can be completed in the field without the use of tools. Two soldiers can attach a Bridgeport to two MDFPs in approximately five minutes. The glazing and armor protects against .30 caliber armor piercing (AP) bullets (U.S. Military designation M2 AP), with nominal masses of 10.8 g (166 gr) impacting at a minimum velocity of 869 m/s (2850 ft/s) or less. The Bridgeport is independently certified by H. P. White Laboratory, Inc. to satisfy the ballistic resistance requirements of NIJ-STD-0108.01 for Level IV protection. This series also meets the US Department of State standard DS-STD-01.01.